The Bold Coast Scenic Byway is a 125-mile scenic driving route connecting a network of communities whose entire way of life is historically bound to its wild and scenic coastal environment. The people who make their living by harvesting the bounty of the land invite visitors to come experience their stories and explore first hand the places and events that shaped them. From the coastal fishing communities of Milbridge and Eastport, the Bold Coast Scenic Byway links visitors with the people, places, and culture of the Bold Coast of Maine, the Passamaquoddy Tribes, and the Fundy Isles of New Brunswick, Canada. Come join the celebration of a proud heritage of harvesting the natural bounty of a wild and scenic coastal environment. Experience the rejuvenating power of pristine nature. Feel the gentle pull of this magical landscape, create unforgettable memories, and experience the simple joys and strengthening challenges of the Bold Coast region. The Byway route is strung with active fishing villages, working-forests, family farms, and prolific blueberry barrens. Lively downtowns composed of historic homes exemplify the wealth of 19th century ship captains and lumber barons. Industrial structures and other artifacts reflect the rich history of the shipping, lumbering, fishing, boat building, and canning trades. A diverse regional network of local historical societies, museums, culture centers, galleries, libraries, and self-guided trails together tell many stories about the communities of the Byway region. But the true storytellers are the people. In this far-flung corner of eastern Maine, people live in rhythm with the shifting of tides, the migration of fish, the rising of the sun, the turning of the leaf, and the warming of soil. Every day brings a new adventure, a new challenge, and a new story. Meet your farmer, but also meet your fisherman, your wreath-maker, your blueberry grower, your lumberman, and your environmental protectors. Meet the people behind the products you enjoy every day: fresh seafood, wild blueberries, delicious maple syrup, healthful seaweed and sea salt, smoked salmon, stoneground mustard, fresh milk, organic meat, granite countertops. Meet the people behind your favorite holiday treats and gifts: cranberry sauce, Christmas wreaths, artisan chocolates, blueberry wine, fine art. Meet the people whose ancestors felled the timber that built sailing schooners that helped our country grow, and who cut the granite stones to build the foundations of great cities. For travelers coming from the west, the Byway route begins on Route 1 in the historic fishing town of Milbridge, or at the confluence of Route 1 and Route 182 in Cherryfield. Both entry points are about 30 miles east of the city of Ellsworth, 50 miles northeast of Bar Harbor, about 60 miles southeast of Bangor, and 69 miles east of Belfast. The Byway provides a connecting link in the Two Nation Vacation route between Eastern Maine and the Canadian Maritimes. 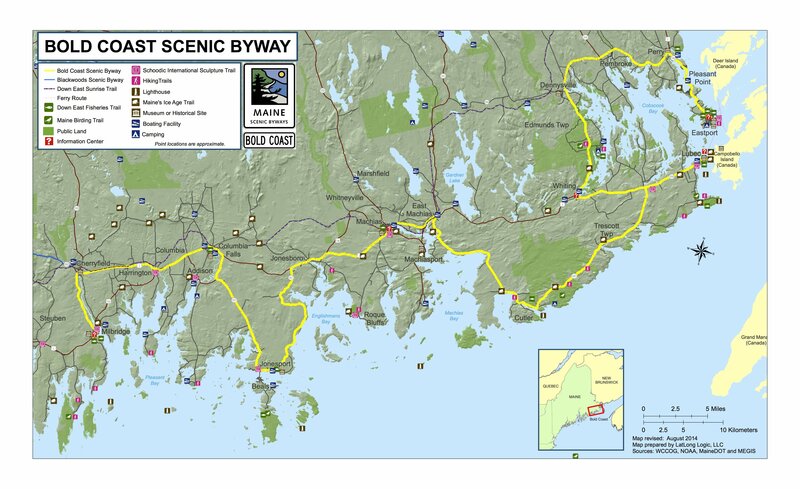 The Bold Coast Scenic Byway is part of a larger loop of several scenic byways in the Downeast and Acadia regions, including the Acadia Scenic Byway, the Schoodic Scenic Byway, and the Black Woods Scenic Byway. The Byway accesses essential parts of the state’s maritime heritage, including sites along the Downeast Fisheries Trail. Modern arts and culture directly accessed along the Byway include the sculpture trail of the Schoodic International Sculpture Symposium. Outdoor recreation opportunities accessed along the Bold Coast Scenic Byway include the Downeast Sunrise Trail, the Maine Birding Trail, and vast acreage of public conservation and recreation land. The Byway route reveals ancient geological stories along the Maine Ice Age Trail, and provides access to wilderness waterways along both the Maine Island Trail and the Downeast Lakes Water Trail. Spectacular side-trips abound – so come, explore deeper, stay longer–the Byway route is simply the spine of an incredible network of fascinating people to meet and amazing places and activities to explore!